Pigmentation can really affect your looks and confidence. Pigmentation is the changes in the melanin (pigment) of the skin. Melanin is produced by skin cells. When these cells become damaged and unhealthy, it affects melanin production and you can develop brown spots or age related spots on the skin. Pigmentation areas can often look like freckles or birthmarks depending on how they are laid out on the skin, and can often appear uneven. Freckles are a very common type of pigmentation. These usually develop after exposure to sunlight and are more visible on people with a fair complexion. Family history can also influence this type of pigmentation. UV exposure is a major influence of sunspot which can occur anywhere on the body. Sun spots are usually light brown to black. These can develop into skin cancer or melanoma and should be checked regularly. Melasma occur deeper in the skin’s dermis. This usually appears as large brown patches on the face and is more common in women. Hormonal changes is a significant factor for this condition. This type of pigmentation can be made worse with pregnancy, stress, UV exposure and often other medication. Our Gold Standard Cynosure Elite+ laser effectively treats pigmentation marks quickly, painlessly, and safely, improving discoloured skin. With our laser, light is taken up by the pigment in your skin cells, causing the melanin to rapidly heat up and break down. Once released your body disposes of the waste pigment through its normal processes. This results in minimal discomfort. Typically three to four treatments maybe required. Often results are visible as little as one treatment. Treatment times can vary between 10 – 30 minutes depending on the size of the area to be treated and type of pigmentation being treated. A chemical peel is a treatment in which an acid solution is used to remove the damaged outer layers of the skin. Peels used acids and active ingredients to deeply exfoliate and brighten the skin and are effective when tackling sun damage, ageing or scarring pigmentation. A course of peels is usually required to achieve the desired results. Our award winning SkinPen is a micro-needling electronic device which can trigger increased cell formation and force pigmentation cells to the surface of the skin, improving texture and tone. Pigmentation occurs when parts of the skin turn dark. Hyperpigmentation occurs when there is an concentration of darker skin patches and uneven skin tone. An increase in the skins melanin (colour) is the cause of pigmentation or hyperpigmentation. Frequent exposure to the sun or sun bed use is a significant cause although an increase in melanin can also be cause by other factors such as genetics, age, burns, spots, medical conditions or hormone changes. 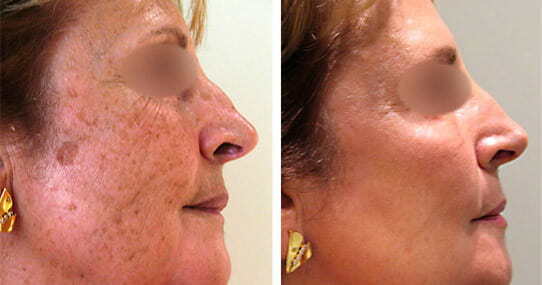 Laser Rejuvenation – This breaks and lightens sun damage and to create a more even skin tones skin tone. Skin Peels – This option can remove dull cells and blemished from the surface of the skin and leave the skin smoother with better texture. SkinPen Micro-needling – This can trigger increased cell formation and force pigmentation cells to the surface of the skin, improving texture and tone. Obagi Nu-Derm System – Our Nu-Derm Skincare is a great medical grade treatment which and can peel, rejuvenate and de-pigment any type of skin safely and effectively. Visible results can often be seen after just one treatment. However results do vary according to the type of skin, degree of pigmentation and the treatment. You will be advised of expected results at your consultation. 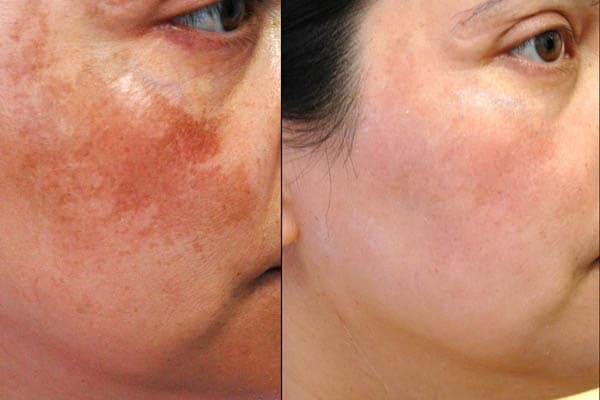 With laser and skin peels slight swelling and redness/pinkness (like a mild to moderate sunburn) are experienced for 2-4 days following the procedure. Often this may heal completely in 24 hours. The aftercare will differ according to the treatment selected. We will advise you how to best maintain your skin during the consultation. Microneedling to stimulate your body’s natural wound healing process to promote collagen.